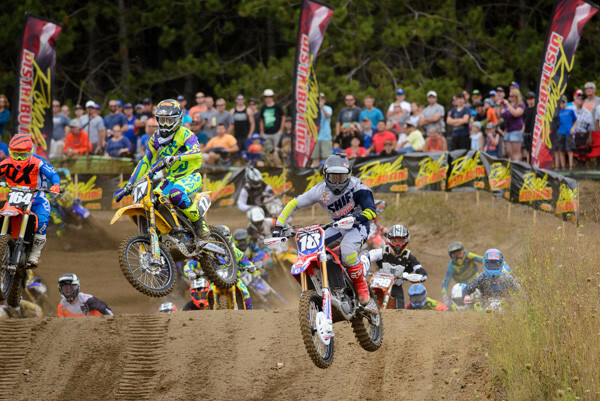 A huge crowd was on hand Sunday at RJ Motosport Park in Barrie, Ontario as it hosted the last round of the 2016 Rockstar Energy Drink Motocross Nationals presented by Motovan. The racetrack at RJ’s was chosen to host the season finale this year after not being on the National calendar since 2004 and proved to be a great test for the riders, and provided spectacular viewing action for the spectators. 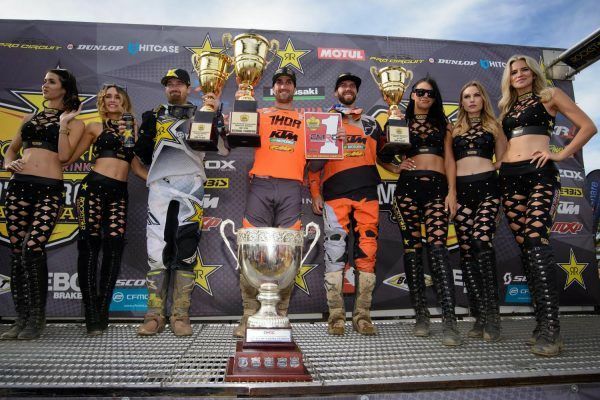 KTM Canada Thor Racing’s Davi Millsaps topped off a stellar season by adding the MX1 title to the team’s accomplishments, giving KTM their first MX1 title in Canada, and their second championship in two weeks after Cole Thompson clinched the MX2 title last weekend. On a racetrack that was described as nasty rough, Rockstar Energy OTSFF Yamaha’s Matt Goerke’s attempt to repeat as champion in 2016 fell short, even after he swept both motos in a completely dominating performance. And in the MX2 class, it was an all Canadian podium led by KTM Canada Thor Racing’s Cole Thompson who grabbed his seventh overall win of the season. After being the fastest qualifier then passing Tyler Medaglia for the lead on lap 4 of the first moto, Rockstar Energy OTSFF Yamaha’s Matt Goerke cruised to the checkered flag, finishing 20 seconds ahead of his nearest competittor and posting the fastest lap of the race. Goerke took the Royal Distributing Holeshot in Moto 2 and led every lap, giving him the clean sweep at Round 10. That was Matt’s third win of the season, and his seventh time on the podium, which puts him second overall for the year. Matt has two years remaining on his contract and will return in 2017 with the #2 on his Yamaha as he tries again to win his second MX1 title. KTM Canada Thor Racing’s Davi Millsaps came into RJ’s only needing 5 points to clinch the title, his first title since he won the 2006 AMA Supercross Lites East Championship. Millsaps started outside the top 5 in the first moto and tipped it over early in a corner. His sixth place finish gave him the title and came after he tweaked his wrist while landing hard off a jump. Davi didn’t line up for the second moto but was back on the podium at day’s end to receive his number one plate. “It was a blessing to come race in Canada this summer, and it has brought the fun back into racing,” stated Millsaps. Monster Energy Alpinestar Kawasaki’s Mike Alessi put in a gutsy performance this weekend riding with cracked ribs and a separated shoulder after crashing violently last weekend at Deschambault. Alessi finished fourth overall after 5-4 Moto finishes and ends up fifth in the standings, only 4 points behind Brett Metcalfe. This is the first time Mike will finish a season without a win since the talented American rider started racing in Canada back in 2014. Filling in for the injured Brett Metcalfe, Yamaha’s Tim Tremblay rounded out the top 5 for the second week in a row with 8-5 moto finishes. After equaling his season’s best finish in the first moto with a fourth, Redemption Racing Big Steel Box KTM’s Cade Clason went down in the first turn of the second moto dislocating his knee and bending his handlebars, but still managed to charge back to finish eleventh. Clason came into the final round in sixth place in the standings but will have to see that #6 go to Tyler Medaglia next year as Clason will be sporting the #7 on his motorcycle in 2017. Rockstar Energy OTSFF Yamaha’s Brett Metcalfe was injured at Round 9 in Deschambault and missed this weekend’s race and finishes fourth in the series for 2016. Honda Canada Racing Fox GDR’s Colton Facciotti has been out since Round 8 and will be sporting the #10 on his motorcycle next year. 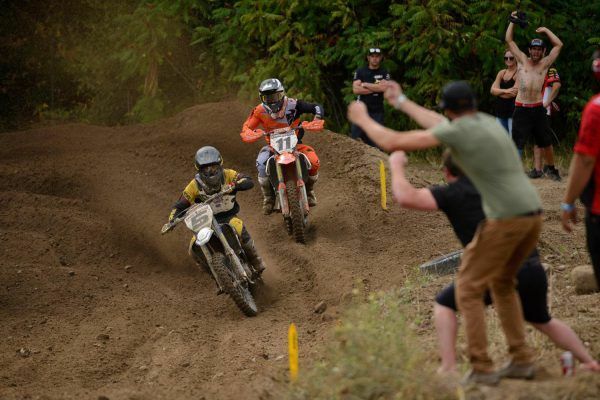 Clinching the title last weekend didn’t slow down KTM Canada Thor Racing’s Cole Thompson as he finished the year with a perfect performance in Round 10, qualifying first and then going out and winning both motos. Thompson sat behind Dylan Wright for most of the first moto until making an aggressive pass for the lead on lap 10. Cole led every lap of the second moto and posted the fastest lap again on route to his seventh win of the year. MX101 FXR Yamaha’s Dylan Wright didn’t look very happy on the podium after the first moto which he led for 8 laps and ended up finishing second. The pass Cole Thompson made on him was aggressive but fair, but it put Dylan on the ground. Wright came back strong in the second moto and made a good pass on Dakota Alix for second, but by then Thompson was gone. Dylan’s 2-2 finishes landed him on the second step of the podium, and puts him third in the series for 2016. Waiting for the last round to pick up his career best finish was MX101 FXR Yamaha’s Jess Pettis who went 3-4 and grabbed the last spot on the podium. Pettis got by both Dakota Alix, and Shawn Maffenbeier on consecutive laps and he was well ahead of fourth place by the end of the moto. Jess was strong again in the second moto and pulled away from Maffenbeier. He ends the season in fifth place with a lot of momentum, only 5 points behind Brad Nauditt. KTM/Factory Connection/Fox’s Dakota Alix continues to finish in the top 5 and get great starts after going 5-3 and finishing fourth overall. Alix pulled the Royal Distributing Holeshot in the second moto and rode a solid race but could not hold off Thompson or Wright. Dakota admitted to struggling in the second moto, and expressed a desire to return next year to improve upon his results. Rounding out the top 5 was Redemption Racing Big Steel Box KTM’s Shawn Maffenbeier who finished 4-5 and ends up finishing second to Thompson in the series. Maffenbeier looked as if he was more concerned with locking down the runner up position in the series than in today’s result and on the podium after the race said that he has not felt like himself the last two weeks. Honda Canada Racing Fox GDR’s Brad Nauditt grabbed the Royal Distributing Holeshot in the first moto and ran up front for a few laps before getting pushed back to sixth by moto’s end. Nauditt finished sixth again in Moto 2 and ends the 2016 season in fourth place in the standings. 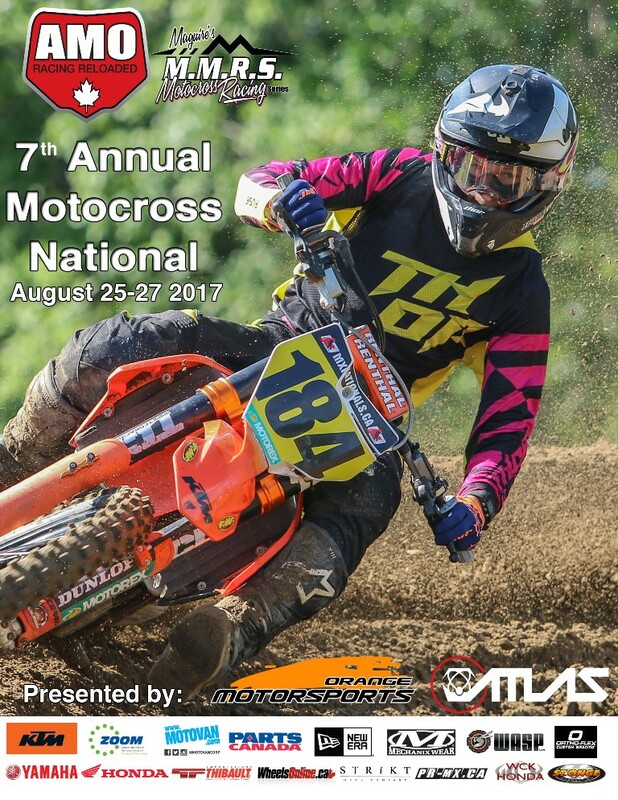 OTSFF Motorsports announces its contention for the 2017 AMSOIL Arenacross championships.